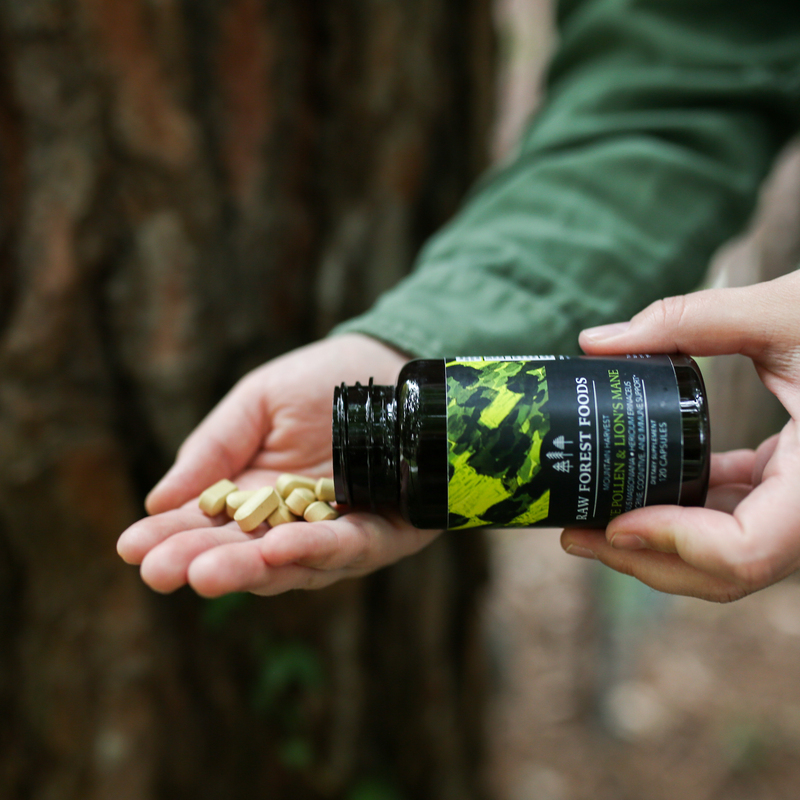 Elevating the body and mind with RAW Pine Pollen from our Mountain Harvest Collection and Lion's Mane Extract (Standardized to contain 30% polysaccharides). Pine Pollen (Pinus massoniana) is used to energize the endocrine system and Lion's Mane (Hericium erinaceus) is used to support the brain and nervous system. * Together, these form a deeply renewing combination. Research into Lion's Mane is helping to redefine the scientific understanding of how the brain renews and repairs itself throughout the lifespan, and how new neurons (brain cells) are created into and during adulthood and old age. Pine Pollen is valued because of its living nutrients, enzymes, and co-enzymes, and its phytosterols and adaptogenic compounds (including phyto-androgen analogs). * We combine the two here to provide a single source for nourishing the body and the brain. 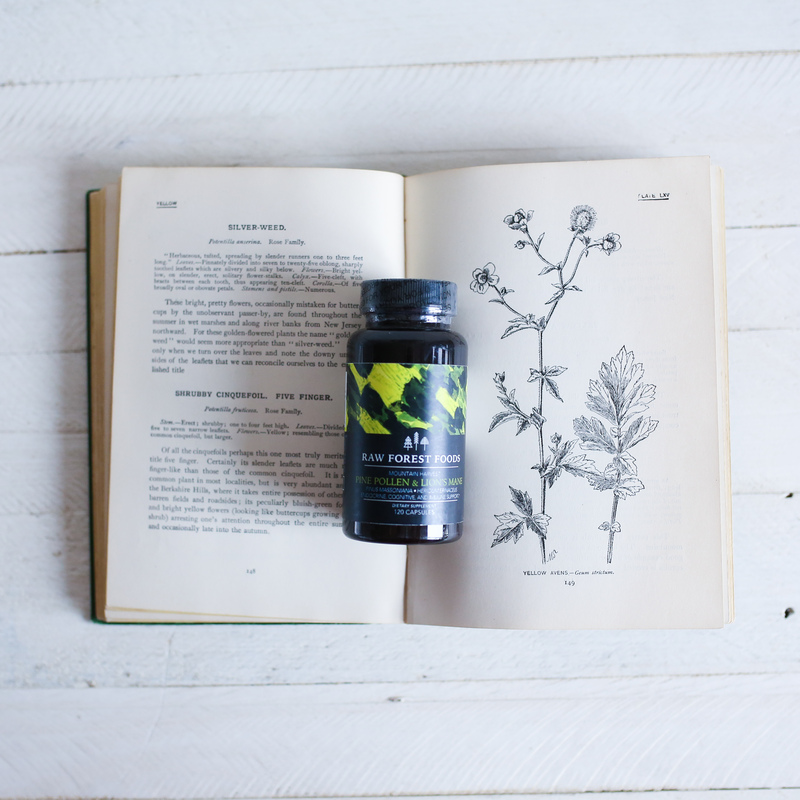 View our RAW Pine Pollen and Lion's Mane Tablets Quick Facts PDF. Each bottle contains 120 tablets. 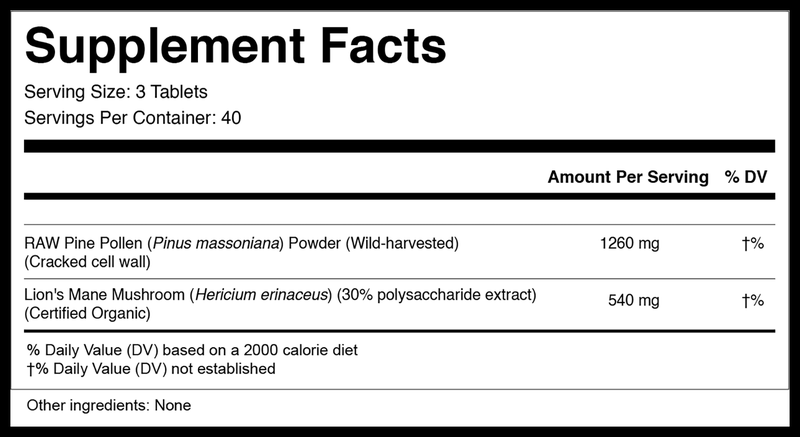 Each tablet weighs 600 milligrams and contains nothing but RAW Pine Pollen (420 milligrams) and Lion's Mane Extract (180 milligrams). The opaque bottle protects the ingredients from damage and degradation by UV rays and helps to keep the contents dry. All RAW Forest Foods packaging is food grade and done domestically in our certified organic, FDA cGMP facility. Lion’s Mane is found native in China, Europe, Japan, and North America. The fungus is both saprobic (feeding on decomposing or decaying organic matter) and parasitic (feeding on living tissue of a host, possibly causing host death). Lion’s Mane can found growing from injured/wounded hardwood trees (commonly from oaks). The fungi tend to fruit in the late summer to fall (Harvest Season) and do so alone (not growing in clusters). In warmer, milder climates, Lion's Mane can be found fruiting during other seasons as well. Correct identification of Lion’s Mane can be difficult. The history of Lion’s Mane spans both centuries and continents, and the fungus is native to China, Europe, Japan, and North America. Ethnobotanical references to Lion’s Mane can be found under various pseudonyms, which helps to illustrate the many cultures who have used/who use it, including Hericium Erinaceus (Latin binomial), Hóu Tóu GÇ (Î«Ê_à) (Monkey Head Mushroom)(Chinese), Yamabushitake (±±_Îü) (Mountain Priest Mushroom) (Japanese), Igelstachelbart (German), Norugongdengi-beoseot (Éü£¬¦_É«_ããø) (Deertail Mushroom) (Korean), Satyr's Beard, as well as its common Western name, Bearded Tooth Fungus. Neurasthenia can be seen largely as a relic of a bygone era of Western medical practice, one that included hysteria and nostalgia as grounds for institutionalization in a sanatorium. However, we can choose to view neurasthenia through a very modern lens. Neurasthenia was first defined by the 19th century by the American neurologist George Miller Beard. Beard originally saw neurasthenia (dating back to 1829) as a purely physical condition, affecting the mechanics of the nervous system—that is, the actual nerves and neurons themselves. However, later in his career (1869) Beard revised his stance and began to see the condition as being psychological in nature, transitioning from the literal nerves to the figurative nerves. Beard defined the condition to include symptoms of "fatigue, anxiety, headache, heart palpitations, high blood pressure, neuralgia (nerve pain), and depressed mood." While no longer listed in the American Diagnostic and Statistical Manual of Mental Disorders, neurasthenia is still listed in the World Health Organization's International Classification of Diseases as well as the Chinese Society of Psychiatry's Chinese Classification of Mental Disorders. Could it be that in the US that neurasthenia has been replaced by more scientific-sounding conditions such as Lyme Disease, Chronic Fatigue Syndrome, Fibromyalgia, Chronic Pain, Dysthymia, and Major Depressive Disorder? Are there commonalities between the symptoms of these conditions and the definition of neurasthenia that Beard provided in 1869? Might we choose to view them through the lens of neurasthenia, not as an etiology but simply as an illuminating factor? The vast majority of Western research has focused on the neurological effects of Lion’s Mane. The research presented here is intended solely for informational purposes, and it should not be confused as medical advice or as grounds for self-diagnosis or self-treatment. Sterols, such as ergosterol and beta-sitosterol. Neuroprotection: An in vitro experiment showed Lion’s Mane to stimulate neuron myelination (myelination is a coating on some neurons which promotes neural function). Lack of proper myelination is a hallmark of Multiple Sclerosis (MS) and has been associated with Parkinson’s like disorders. Accelerated wound healing and reduced immune cell accumulation in animal models. Use of the fungus has been noted in treatment of gastric ulcers and esophageal cancer in China. Lion's Mane is considered a safe, edible mushroom. Additionally, animal models have shown Lion's Mane to be non-toxic. With that said, some people have stated that the use of Lion's Mane extract can cause an itchiness of the skin, due to increased Neural Growth Factor (NGF). Precaution should be taken in the case of allergy or allergic symptoms. One case of a probable adverse reaction to Lion's Mane (respiratory distress) has been reported in the literature. The suggested dosage is 3 tablets, taken twice daily. At RAW Forest Foods, our favorite way to use this product is simply to take it with fresh, cool water, and to consume it with food. This is how we recommend others use the product. Of course, whichever way you decide to use it, the best way is the way that ensures regular, consistent use, because no gain is made from a product that sits untouched in the cupboard. Ever since I started using the Raw Lion's Mane and Pine Pollen Tablets, I have felt more energized, restored, and balanced. I feel that the tablets are deeply nourishing and are helping to correcting any imbalances in my body. All this, while simultaneously working to rebuild my organs to work more optimally. I also enjoy the fact that they are raw and chewable tablets. The taste is lovely and satisfying! Overall, I think the product is fantastic and would recommend it to anyone who is looking for a potent and nourishing superfood blend to incorporate into their everyday diet. Been taking about two weeks now and the first thought that comes to mind is that my body doesn't hurt. I'm 63 years old and have bad back along with other physical problems. But now I feel good and move my body and feel good. Along with feeling good I wake up fresh and have the mental energy to take on the day. Us to wake up and mess around getting ready for work, now I'm up and work out before work. Great combination that works really well. A potent synergy for sure.